In 2018, they are known to music lovers around the planet. Their surname is instantly recognized as the most prominent, most prolific and most successful family in the modern music industry. For multiple generations now, there’s just no parallel to The Jacksons. Of the original 9 Jackson siblings– Rebbie, Jackie, Tito, Jermaine, La Toya, Marlon, Michael, Randy and Janet– all have released at least one solo music project, and have produced hundreds of hits. So after school one afternoon in November 1967, Michael, 9, Marlon, 10, Jermaine, 12, Tito, 14, and Jackie, 16, piled into the family Volkswagen with Joseph and rode across the state line to Chicago’s West Englewood neighborhood, parking in front of Sunny Sawyer’s recording studio on West 69th. Today that address is a vacant lot overrun by six-foot weeds, neighbored by the last surviving commercial buildings on the block—a tavern called Mitchell’s that’s attached to Rainbow Food and Liquor and a boarded-up pharmacy. But in the late 60s it was at the heart of a busy business district. “The Jacksons were little angels,” Sawyer says, “and real professionals, doing their own stuff.” Joseph had trained Tito on guitar and Jermaine on bass, and young family friend Johnny Jackson (no relation, though Motown would bill him as a cousin) was an excellent drummer. All three play on the recordings, but Keith supplemented Tito and Jermaine with adult musicians, including Richard Brown on rhythm guitar, Freddie Young on lead guitar, and Ray Grimes on bass. Though not an immediate chart success, the single caught on well with local radio in the Chicago area, and was a great seller at the groups shows. But ultimately, it was a live performance, opening up for Motown act Bobby Taylor, that would finally get the attention of legendary label magnate Berry Gordy, and put them on the world stage. 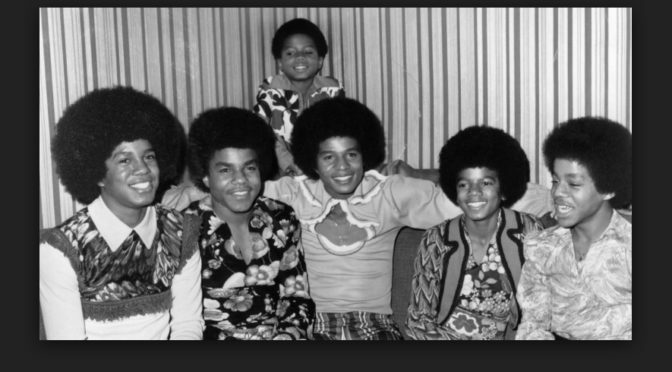 And so it goes… the start of the Jackson family story in the recording industry. But in 2018, the family is ready for a whole new era. Over the holidays, crowds were left stunned by Jaafar Jackson, performing with his father Jermaine and brother Jermajesty. In the coming years, we can expect big things from him, and lots of other members of this incredible family. Happy 50th Anniversary to The Jackson 5, and their debut single, Big Boy.